Just a few days ago, Michelle Obama dined at a restaurant that cost $1000 per couple. They probably had mayo. FORT MILL, S.C. – Powerade was replaced with water. Mayo was banned, too. Such are the conditions in the Fort Mills High School cafeteria. “When lunch ends, I feel that the trash cans are more full than my stomach,” student Lindsey Russell tells the Fort Mill Times. 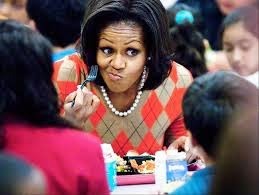 That’s happening because schools are required to give students certain types of foods to remain in compliance with National School Lunch Program regulations championed by First Lady Michelle Obama. “If I don’t want an apple or piece of bread and I am handed them, I can guarantee that it will end up going to waste,” Russell says. High school senior Luca Botzenhardt says he tastes a difference and he’s “disappointed.” Even the sauces taste differently this year.